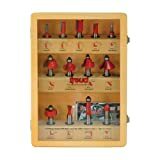 This is an excellent starter set for any woodworker. Once you use 1/2" shank bits , you'll never want to buy a bit with a 1/4 inch shank again. They really do cut smoother. The carbide is a little harder than the average bit. It will stay sharp a little longer than many other carbide bits . I find them very good with most hardwoods. They chip a little faster than some if you hit a misplaced brad nail or other hard object. Some will just keep on going. Not a Freud. This shouldn't be a problem most of the time. 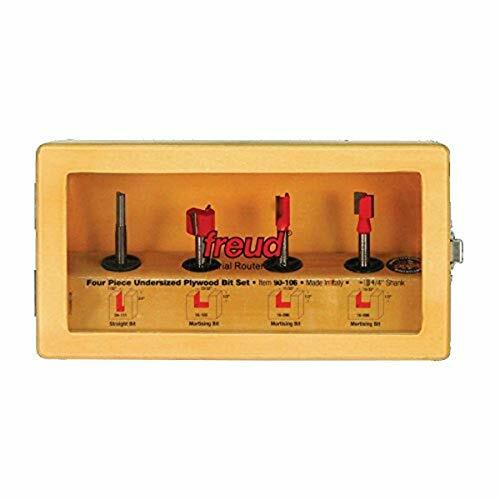 Freud was ranked in the top 5 in a fine woodworking bit test. It was far ahead of all other brands available at Amazon.com though. Jesada was ranked last out of 17 brands. I would stick with the Freud set. They are very good and reasonably priced to boot. I am very pleased with the versatility and the quality of this set. It has allowed me to make a beautiful fireplace mantle out of solid maple. The cuts were clean with no tears, the bits I used stayed sharp throughout the routing. The bits in the set are varied enough to let you do almost any project you would like. 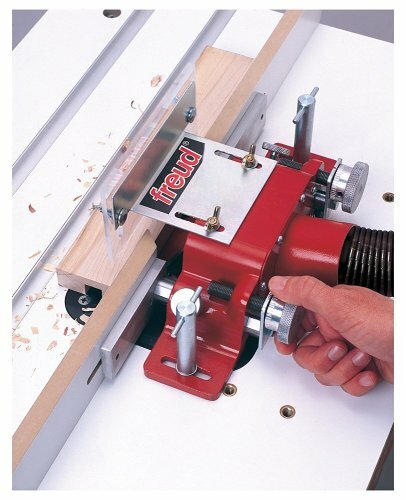 I highly recommend this bit set to the novice woodworker or the experienced. It is great. I have used this set of Freud bits in my shop for several years and I have not needed to have them sharpened yet. The cut is smooth and chatter free. These bits seem to cut through the hardest of wood effortlessly. 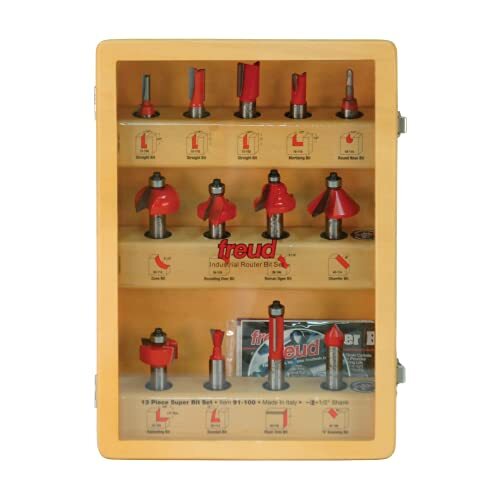 I own many other brands of router bits, and I think that Freud has a far superior product. You may pay a little more for these bits than the cheaper bits from other manufacturers, but the money is well spent. A very fine set of bits, I'm pleased. The only glitch is the plastic form inside the box; it allowed a bit to get loose and rattle around (and chip) during shipping. Amazon set it right, but I wish Freud would find a way of really locking the bits in during shipping. Other than that, a wonderful starter set. While I haven't routed any hardwood other than oak ply, these bits cruise through everything I've sent their way! The half inch shanks really stabalize them for super clean cuts. This set has a good selection of shapes to get you started if you don't have any or will upgrade some of your favorite shapes if you do. Worth the price. The ALEPSH-5 expansion brakets are now available on Amazon. I ordered the fence and the expansion kit and received them in fine condition. Freud has redesigned the expansion option for larger base plates. It is no longer an aluminum plate that bolts to the bottom of the fence. It is now a pair of brakets that attach to each end with press fitted bolts. Mine went together easily. The attached brakets fit snuggly and are solid as a rock. I'm using mine on a table extension for my table saw and it works great. It would be nice, however if they included the expansion kit by default. I'm sure most people will need it. I knew of the issue with the mounting width before building my table, so I installed the insert to fit the fence (rotate the insert). 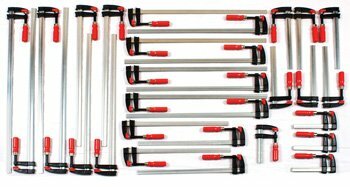 It gives the functionality of a shaper fence. As long as you pay attention to the base width, this is a great fence with very good accuracy! Should have read the reviews before ordering this thing. No instructions, won't fit my base, can't get the extensions to make it fit, Freud website is junk and their customer service is abysmal. Selling mine on eBay since the 30 days has expired. Looks great, but looks are truely deceiving. Bought the SH-5 to outfit my newly made custom router table. Within minutes of opening the box I knew I made a mistake. The fence itself is a well designed and crafted product, however, this doesn't do much good if it can't be installed. There were no installation instructions, nor contact information for customer service. Then, after working with the unit for awhile, it became evident that I needed the ALEPSH-5 extension plate to make it work with my insert. Good luck finding one. I was unable to find any information on Freud's website, and when I called them, they directed me to a dealer in Florida. They didn't have one, didn't know when they could get one. I gave up and am in the process of returning the unit to Amazon. I bought this tool then returned it because I found it time-consuming to set up and use. Still, it's quite a bit cheaper than the Porter Cable 557 (which I would recommend), and once you get it all adjusted (and assuming you don't need to change the setup much) it does work reasonably well for the money. The manual is plain awful. Pictures are so low-res that I can't make sense of them. Instructions on using the unit are incomplete. The tool arrived in need of readjustment. Since I've never used bisquits before, it took me a long time to figure out how it should work properly, then I was able to get it to adjust... just barely: the adjustment screw was nearly at the end of its range when I got the depth adequately set. The manual says that this adjustment should be set properly when the tools is new. I agree! It wasn't, though. The tool can't do many of the things that the PC557 can do. The fence in particular is not very flexible. On the other hand I expect that 45 and 90 are most of what I'll use, and this tool does those ok. The fence on this joiner is flimsy and allows for inaccurate slots. Should only be use for the very roughest work. Try another brand, very disappointing after the fine 15 amp router I bought from Freud worked out so well. They do make great blades and bits however. I bought the Freud JS102 because I thought it was one of the better brands out but, not any more. The other reviews you read here are accurate. First, THEY DID SCREW UP THE measuring devices on the face plate that is supposed to ensure a level cut! Because of this, it is almost impossible to achieve a level cut! This seams very consistent with other reviews and I noticed the same thing. This is likely a manufaturing problem as many of the joiners have this same problem. Secondly, I found adjusting the depth of the biscut cut very very difficult. Freud says it "pre-sets" the biscut depth at the factory. Well, it was not and my #20 biscut cuts were too shallow. In an attempt to correct this problem, I followed Freud's directions to manually change the depth. This was almost impossible. The "little wrench" they give you to make needed adjustments is too big!!! If I had not had my own tools to fix the problem, the depth could never have been changed! Finally, the manual is awful. The pictures are of horrible quality and many points one would think of as important are not included in the manual. Oh, one more thing, I don't know what amp motor I have! The box and tool both say it is a 6.5 amp motor but EVERY WEB SITE and even FREUD themselves say the motor is 5 AMPS! Needless to say, the product made its way back to the store and I spent $50 more and got the Porter Cable. I have ordered this product for more than 2 weeks, and have no sign of delivery status. The service is very poor. The biggest problem with this tool is the total inability to adjust the auxiliary fence parallel to the blade. The fence adjustment mechanism seems poorly designed and engineered. The amount of discrepancy is small, but when joining surfaces that can accomodate only one biscuit, the joined pieces will be totally misaligned. The particle board(melmolene? )guides had too much flex so I replaced them with 2" X 3/8" X16" aluminum guides milling the same slots and recess as on the wooden ones. Now I have a perfict piece of equipment worth 5***** .Maby some one will make this available. As my use of the router has been increasing I needed something better than my old Craftsman 12X16 aluminum table with enough said about that. I decided to take a chance on the frued system. Well I am completely satisfied, not one complaint. The router is super and the collett was already in so no problem there. I do agree that the collect nut would be better with more depth on the nut. The 5 piece set is what I initially bought. It includes the glue up joint bit, which is nice for gettting a lot of panels to line up properly while gluing. It also includes the door lock bit, which will turn your raised panel, into a drawer front by removing the material around the edge of the back of the door face. I bought this set as well. Why? Because when making kitchen cabinets, the raised panel bit that they provide with the 5 piece set is too small for a large cabinet. (Unless you prefer that look) So I bought this set, to pick up the 3 1/2" panel raising bit. That requires a large opening of at least 3 5/8" on the bottom of your router, and the opening on your router table as well. The Bosch 1619EVS is even larger than that. The Fein RT-1800 allows for the the use of a 3 1/2" bit, but the casting prevents you from plunging a bit that size. Not really recommended, because you might accidently adjust it into the base. Their are others also, but most fixed base 2 HP routers won't accept such a large bit. So measure first. Overall this is a great set of bits. They do a great job, and last a long time. Highly recommended. For those reading the review of the 99-218 panel raiser, try using a 1/8" backcut on your panel and your alignment problems dissapear. I found the Freud 97-102 an excellent product. However,I found to get the maximum profile(1-1/4")and keep the panel & rails flush in the front,I had to use 3/4" stock for the panel, and at least 13/16" stock for the rails/stiles. 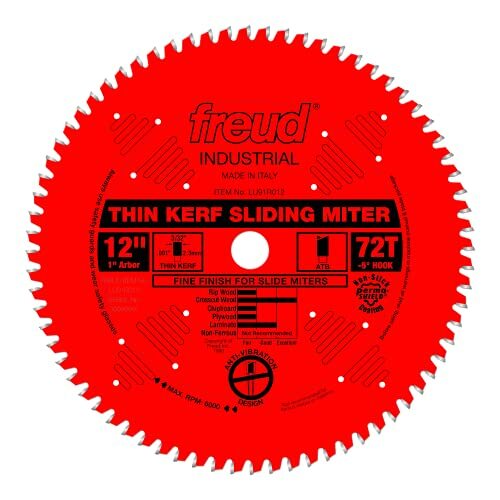 (The panel cutter has a 5/8" depth of cut) A better choise is the Freud 97-100 set. It has the same rail/stile bits, but the panel bit included can take as little as 3/8" depth of cut and still get the full profile! This means you can use thinner stock if needed,and end up with a much better proportioned door. The popular 5 piece set is what I initially bought. It includes the glue up joint bit, which is nice for gettting a lot of panels to line up properly while gluing. It also includes the door lock bit, which will turn your raised panel, into a drawer front by removing the material around the edge of the back of the door face. I bought this set as well. Why? Because when making kitchen cabinets, the raised panel bit that they provide with the set is too small for a large cabinet. (Unless you prefer that look) So I bought this set, to pick up the 3 1/2" panel raising bit. That requires a large opening of at least 3 5/8" on the bottom of your router, and the opening on your router table as well. The Bosch 1619EVS is even larger than that. The Fein RT-1800 allows for the the use of a 3 1/2" bit, but the casting prevents you from plunging a bit that size. Not really recommended, because you might accidently adjust it into the base. Their are others also, but most fixed base 2 HP routers won't accept such a large bit. So measure first. 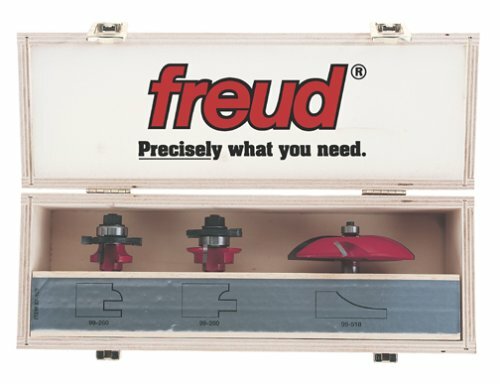 Freud designed this tool as a high-powered plunge router with all the important basic features but without the bells and whistles found on more expensive competitors' tools. The result is a solid workhorse of a router at a reasonable price. And don't think it lacks anything woodworkers need to handle a wide variety of tasks. 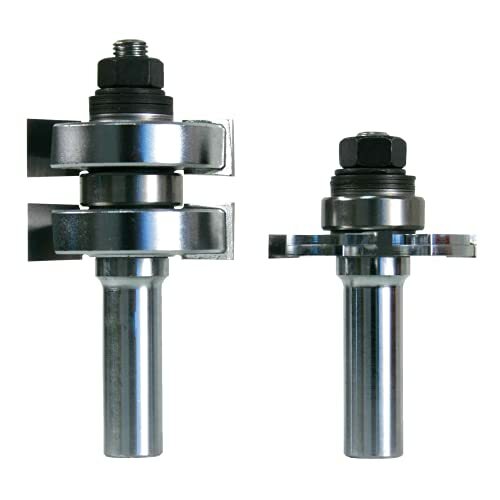 In fact, this tool includes a height-adjustment knob for table mounting and a dust collection port, both of which are considered extras on other routers. I just recieved my Freud 3.25hp plunge and I'm impressed so far. The Bad- -The mounting screws (for router table plates like Rousseau) are a little short for me, and they're a metric thread. I thought the threads were 1/4" x #20, but I was soon proven wrong. This isn't the end of the world, it just means I have to run down to the hardware store for some longer screws. -This router is pretty heavy. I guess I can't complain much here, as mine will be mostly be table mounted. I think the Freud is lighter than most of the other brands in this power range. -The plunge action is a bit stiff. I can't complain much as this is a big router, meant for big jobs. You probably won't be doing any 1/16" freehand rounding over work with a big router like this. -The plunge lock lever works opposite what I'm used to on my old router - to lock the plunge, you lift the lever and to unlock, you lower the lever. Again this is not a major concern, just something I have to get used to. -The chuck wrench that comes with the router looks a bit flimsy, and I'll probably step it up to a heavy duty one. The Ugly- -It's a lean, mean, routing machine. Solid black with a touch of gray. No pretty paint job like DeWalt or Porter Cable. But let's face it, who cares what color the thing is? It does the job and you'll save a pile of cash. 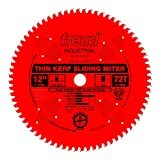 My 2 cents - Buy the Freud, take the cash you save and buy some bits, template guides, or a router table insert. A comparable Porter Cable / Bosch machine with above specifications would cost about 50% more than what I paid, I believe. 1) The finish does not compare with PC or Bosch. 5) 6mm * 12mm metric screws are too short for table mounting (you need at least 6mm x 25mm long screws for table mount). Home Depot has it! 2) Push collet into collet nut with your finger till it snaps in completely. Now the collet springs open fully and is a tad over 1/2" diameter. The bit (shank) will slip in without a problem. In other words, make this assembly outside the router. 3)Push this collet / bit/ nut assembly into the router; tighten the nut with collet wrench (spindle lock mechanism will hold the spidle; you need only 1 wrench). I could do this very easily even with the router mounted inside the table. You only need to learn how to do this once. If you are a practical type of a person (looks and frills do not matter) person, you will love this machine because it is a great value. Even though this is my first router (and I am a noice wood-worker), I am having fun with it. I know I do not have to upgrade to a bigger or more powerful machine (like with my other tool purchases). Though it weighs 12 plus pounds, it is fairly easy to do hand routing because it has very ergonomic handles and is well balanced. The switch is easy to use (in hand routing mode) and so is the height adjustment. The soft start feature is probably the best feature (I did not ruin even my very first trial piece). Some people have compared the noise with a 747 taking off. Its more like a 747 cruising! Strangely, I found it most uncomfortable (audio level / frequency) at setting # 3 (out of 6). However, I do not believe this machine is any noisier than any comparable router (or some teenage drivers). 1) poor cosmetics / industrial appearance. Overall, I am very happy with the purchase. I got the router, router table (a must have, in my opinion) & a 12 piece (1/2") bit set for a marginal amount over the cost of a comparable Porter cable machine. I have waited over a year to offer my opinion on this router so as to be as objective as possible. For backgound, I am a serious DIY. I have this machine mounted in my router table and love it. I opted for the Freud based on price and previous reviews I read. I have not been disappointed. I have cut raised panels with ease and would recommend this unit to anyone who has a need for this much power. Possibly the 3-1/4hp Porter Cable is better for a production shop, but for the money this router will serve the average guy very well for many years. I bought this router solely to be a table router. After a lot of research, it seemed that for the money, considering the hp you get, this was one of the top choices. 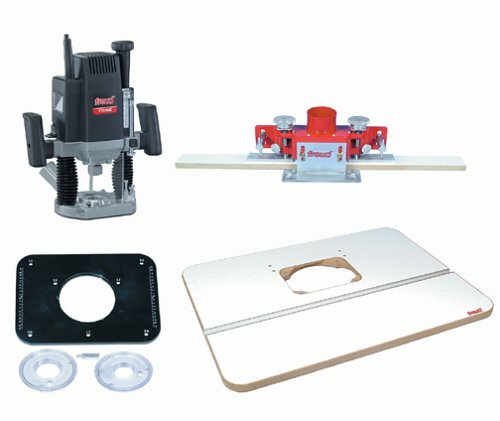 I'ld been to a woodworking show recently, and found a few of the exhibitors demo'ing their router tables with the Freud router installed in them, so I knew it was a good candidate for the job. 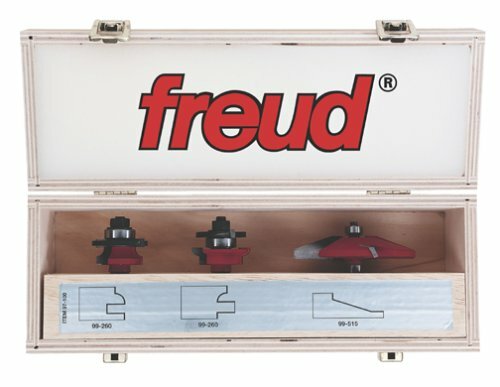 I planned to install the Freud in a Rockler table, which has a nice 1/4" aluminum plate. The plate came predrilled for the router. The plate is high quality, with a good, stiff, flat surface to mount the router to. When all the components came in, I gave them a thorough inspection. The first thing I did was to remove the plastic plate from the router bottom. You don't need it in a router table setup. I then matched the Rockler plate to the Freud router base. As another reviewer has commented, there was a problem with the flatness of the Freud base. The plate would "rock" and wobble when matched up to the base. Not a lot, but enough to bother me. I suppose you could just go ahead and attach the base to the plate with the three screws, but you would probably end up warping the plate a bit. 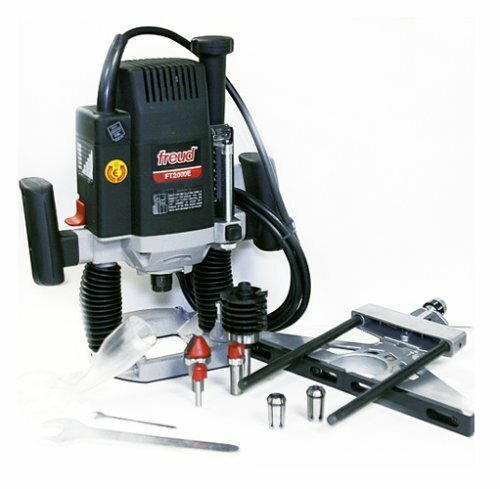 I thought of sanding the base smooth on a sanding machine, or milling it, which would certainly give you a flat base. But then you wouldn't know for certain if the base were "true" to the axis of the router shaft. (In fact, I wasn't certain the base was true to the shaft to begin with.) You want the base to be true so your router bits mount truly perpendicular to your table, and don't run off at an angle, imparting an angle to your cuts. I was lucky enough to find an excellent solution. (I guess I'm also lucky enough to have a metal lathe.) I was able to lock a 1/2" shaft in the router, chuck the other end of the shaft in the lathe, and turn down the bottom of the base plate so it was flat and true. I had to remove the handles from the router to give me enough clearance on my lathe, and tape up the electrical cord, but otherwise I didn't have to dismantle the router. I spun the router at relatively slow speed, and had no problem with dynamic imbalance, a bit to my surprise. I didn't have to remove a lot of metal, just enough so that I could see the whole base had been touched by the carbide cutter. The operation went very well, and the base turned out flat and a perfect fit to the Rockler plate. I also know that it is now true to the axis of the router shaft, since that was the axis about which it was turned. ... With the router mounted and installed on the table, I've found it has ample power for all the jobs I've done with it so far. I like the large elevation knob and the on/off switch. Both are fairly easy to access from under the table. If you wanted to get fancy you could mount a separate on/off switch to the bottom front or side of the table, and go with one of the various router elevation devices that can be accessed from the top of the table. But I haven't felt the burning need for either of these things yet. And yes the router is a bit loud, but not to the point that it bothers me. (And I certainly don't forget and leave it running when I'm through with a job!) I've had no problems using either the 1/4" or 1/2" collets. If the router didn't need the tuning, I'ld give it a 5+ for value as a table router. Since it did require some, I give it a 4. Pulled this tool out of the box and checked the collet right away. Mine was actually snapped into place already. I chucked up a 3/4 straight bit and set the edge guide, I set it to 5/8 deep and routed out 12 inches of red oak like it was butter. I haven't loaded this unti into my router table yet, but will shortly to make some raised panel doors. I have a feeling this router will throw the panel raising bit with no problem. As for the base, mine is rock steady, sits flat and does not wobble. As for the edge guide, it is not the best in the world, but it does the job very well. 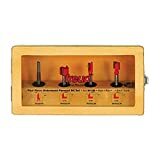 Tired of your dados being too lose when using plywood? These bits assure tight fits for undersized plywood joints and always, the Freud products work great. You can't go wrong with these bits. If your doing some plywood joinery, these bits won't let you down. Incredibly smooth cuts with no tearout. These frued bits just "sing" through the material. Definitely worth the money. We all know that a 2x4 isn't really 2" x 4", and plywood is the same way. These bits are undersized to compensate for the sanding process of plywood. These bits will provide a great fit without any slop. Don't use this set for making Dado's for MDF because 3/4" MDF is really 3/4", 1/2" is really 1/2" and so on.